Home Wordpress How to Bulk Delete All WordPress Comments? Today we see about how to bulk delete all WordPress comments on your site. We have used two methods to remove all of your WordPress site comments. I will list those two approaches in the below paragraphs. There are many situations you want to delete all of those comments from your WordPress site. For example, I created my first dummy sites with comments, before start to move my site to live server I have deleted all of the dummy comment from the site. Sometimes website owners don’t want to see comments on their site in that time they will remove comments. If you receive lots of spam comments, then you can use Akismet plugins for to reduce your spam comments on your site. You can also disable comments section using your WordPress dashboard. If the above situations are not for you, then read and apply the below methods for you. Before start to delete all of your comments first Backup your site. If you delete all of the comments, you will not undo this process because WordPress would not allow. This is the main reason I recommended to you to backup your site. There are two methods available to delete all of those unwanted comments. The Delete all Comments plugin can be used to remove all of the comments on your site. After activating your plugin, you navigate to the plugin page; it shows you how many comments are available. You can select all comments from the dashboard and delete all of those comments just a single click. This plugin removes all comments including spam and trash from your site. In this method, you can delete comments quickly without any effort. We use both MySQL and phpMyAdmin for delete all comments from our site. Liquidweb Offers one of the industry standard cPanel for their customers you will use our agency Liquidweb Coupon to get industry standard panel for your websites. If you want to apply this method, first you need to login to your cPanel of your server and then click the phpMyAdmin. After move inside of your phpMyAdmin panel, you need to locate your WordPress site database and find comment table names in your database. Those table names are wpprefix_comments and wpprefix_commentmeta and table names are differ based on your table prefix you already choose during the WordPress install. 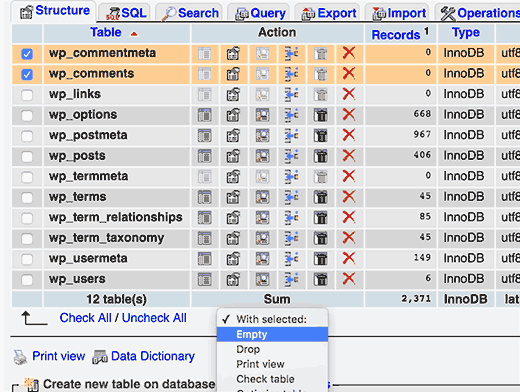 After selecting comment section table in your database and locate your ‘with selected’ drop down menu and click the empty menu. They will show a warning message and click yes they will delete all of your comments on your site with a single click. And another method removes all comments using MySQL console. First login to your MySQL consoles and type the below line they will delete all comments automatically. We hope you learned a lot of things from this post if you have any doubts about this post How to Bulk Delete All WordPress Comments? Please ask your questions using the comment section.